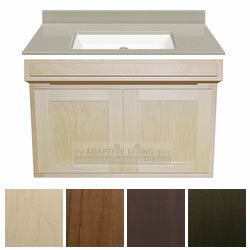 ADA Compliant Wheelchair Vanity Package includes: 36" Wall Mount Accessible Vanity, Cultured Granite Top with Integrated Backsplash and White Bowl. Choose from 3 door styles and 4 finishes. ADA Compliant Wheelchair Vanities and matching Cabinetry Solutions are made to add beauty, functionality and rugged durability to your new or remodeled bathrooms and restrooms. Do you need to "Color Match" an existing trim and/or cabinetry? Call us to learn more about our ACAP Services (As Close As Possible). Adaptive Living Store's cabinet face frames are crafted from solid 3/4” hardwood and provide ample support behind the top, bottom and outer edges of our 3/4” hardwood framed overlay doors. These features along with 3/4” hardwood ply sidewalls, 1/2” thick full-coverage back panels and unique assembly techniques create cabinetry with the structural integrity needed to withstand the impact of powered or manual wheelchairs. What you will get from the Adaptive Living Store — REAL WOOD Cabinetry shaped, hand finished and fully assembled by Authentic American Craftsmen — at a price that rivals the lesser-grade paper veneered, particle board imports. So if you require, or just desire, high-quality wheelchair accessible cabinetry affordably priced and designed with many user-focused details such as valuable internal storage that accommodates essential bathroom supplies and ample room for completely enclosed pipes — the Adaptive Living Store can provide the solutions you need. Important Note: Contractor Series Orders cannot be canceled or returned. Contractor Series Package Orders ship in 3-5 Business Days. Freight Delivery: Orders ship via freight. Please allow 2-4 business days for most freight delivery. Freight Delivery Does Not Include Lift Gate Service: If you do not have the manpower onsite (carrier will not participate in manually lifting freight from truck) or facility to receive freight, you will require lift gate service. Please call at time of order to arrange for lift gate service to your destination. Additional Freight Services Available: Notification Prior to Delivery; Residential Delivery; Lift Gate Service at Destination. Call for fees that may apply for these service(s). Typical Time of Delivery: Freight deliveries occur between 7am and 6pm in most time zones. If you have a specific date or time window that you require delivery within, once you have received your tracking information, you can contact the carrier to coordinate date and time of delivery. We encourage you to make this call. If carrier attempts delivery between above stated hours, and no one is available to receive delivery, the carrier will notify you of their attempt to deliver and charge you a re-delivery fee prior to final delivery. Your Responsibility at Time of Delivery: In the rare event a shipment is damaged, please take photos and detail damage on your copy and the carrier's copy of the delivery ticket before the carrier departs. Call the Adaptive Living Store immediately at 888-447-7816 and forward photos and damage description to service@adaptivelivingstore.com. If the carrier leaves before damage has been documented by you on the carrier's copy and your copy of the delivery ticket, all claims of damage will be denied.